The basic Traditional Japanese Knife shapes are YANAGIBA (Long slicing knives) DEBA (Heavy Knife used for fileting a beheading fish) and USUBA (Cleaver shape for vegetables). They are true one sided knives with the edge coming to a chisel point. The front side has a pronounced bevel known as the shinogi line. The back side is concave so that when laid on a sharpening stone, the only part that touches is the cutting edge, spine and a bit of the tip. This allows you to sharpen the back side of the knife without scratching it up. 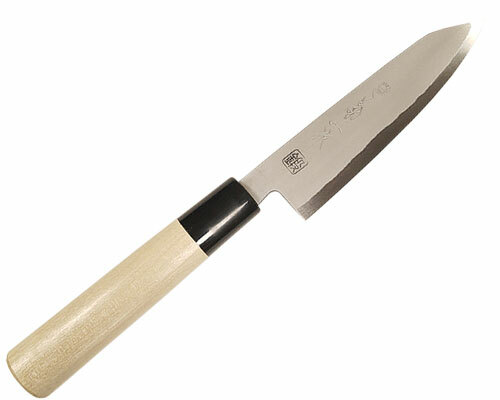 Many chefs simply lay the front of the knife on the stone with the shinogi line flat and sharpen. Then lay the back of the knife flat on the stone simply to remove the burr. Please note that these are pure carbon steel knives and will rust if not wiped dry after each use. The Kikuichi White Steel 8.25 in. 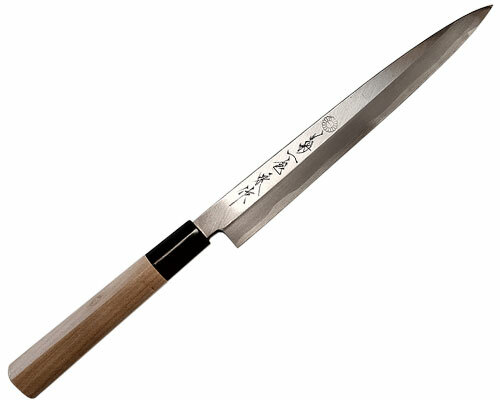 (210mm) Gyuto Kiritsuke is a two sided knife that features a ho wood handle with a Buffalo Horn Ferrule, and comes with a wooden saya. The Kikuichi White Steel 5.9 in. (150mm) Petty Kiritsuke is a two sided knife that features a ho wood handle with a Buffalo Horn Ferrule, and comes with a wooden saya. 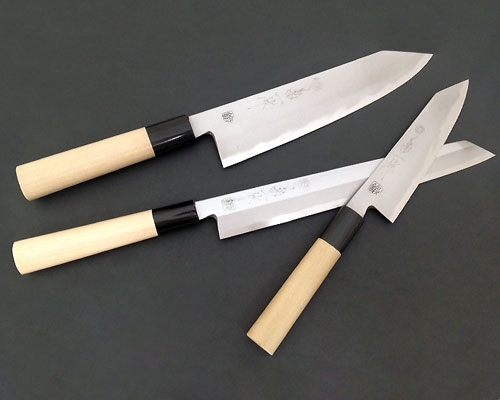 The Kikuichi White Carbon Kiritsuke set features 3 knives; 9.5 in. 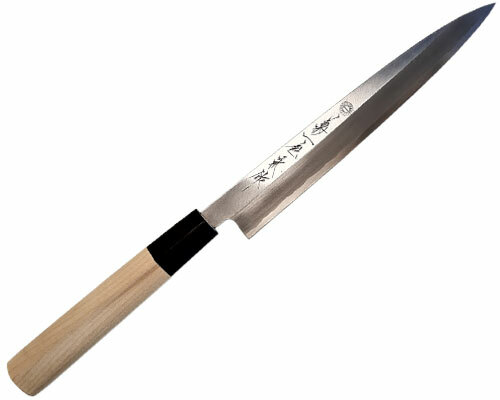 Yanagi, 8.5 in. Gyuto, and a 6 in. Petty. Each knife is in the shape of a kiritsuki, with a chiseled tip. The kiritsuke shape is what the Japanese refer to as a "master's blade." These knives feature a ho wood handle with a Buffalo Horn Ferrule, and each knife comes with a wooden saya. The Gyuto and Petty knife are two sided, made of white carbon steel. The Yanagi is white carbon / kasumitogi, and is one sided. 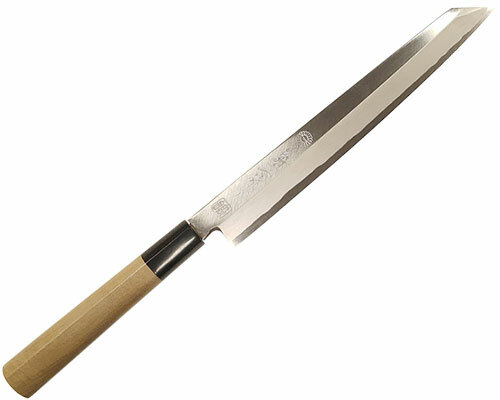 The Kikuichi Kasumi (White Steel #2) 300mm Takohiki specializes in slicing, often replacing the yanagi in tasks like preparing octopus, squid and breaking down large tuna. This is a high carbon knife and should be wiped down after each use, avoid food items high in acidity, do not attempt to use this knife on strong bone joints(beef, pork) or frozen food. This Takohiki has a single sided bevel, ho wood handle and a blonde buffalo horn ferrule and comes with its own wooden saya. 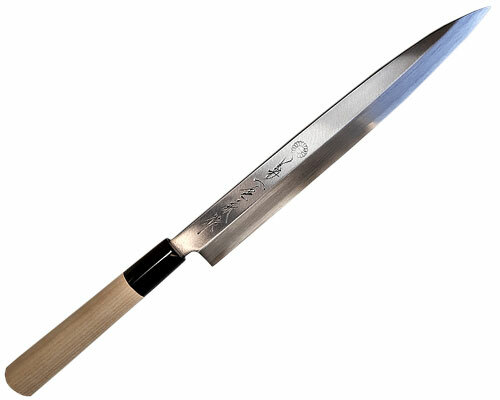 The Kikuichi Kasumi Traditional Carbon Yanagi is a one sided, hand forged, pure carbon slicer. This knife is ideal for slicing meats and fish with precision. The handle is Ho-Wood with a Buffalo horn ferrule. The Kikuichi White Carbon 9.4 in. (240mm) Yanagi Kiritsuke is a traditional, hand forged carbon shaped and sharpened Kasumi Knife. White steel is welded to a soft steel backing (hagane/shingane). Black Buffalo Horn ferrule on a ho wood handle. Saya is included. This is a one sided knife. 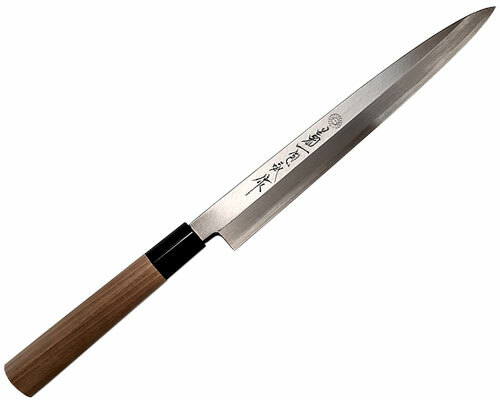 The Kikuichi Kasumitogi Yanagi is a traditional CARBON hand forged, shaped and sharpened Kasumi knife. White steel is welded to a soft steel backing (hagane/shingane). Ho-wood handle with a Buffalo Horn ferrule; saya is included in the price.